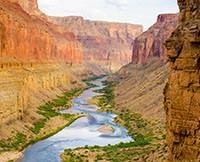 My husband Scott and I have tried to pin down the best part of our Grand Canyon Rafting trip. The fact is, it's impossible! The scenery can't be captured effectively by camera, sleeping under the stars (with no mosquitos!) and hiking/playing amidst the waterfall/grotto has to be done at least once in a lifetime, we ate better at camp than we do back at home, and the comarardarie amongst the guides and all of us felt as if we had all been friends for years. We chose a week where the moon would be full and it paid off. The beautiful glow of the moon against the majestic canyon walls was something we'll never forget. Our last night at camp was punctuated by our trip leader Wylie's guitar playing and singing. I'm a sucker for sitting around a camp listening to a strumming guitar and singing along (even with made up words! ), so this was the icing on my canyon cake. We'll be back. We promise.